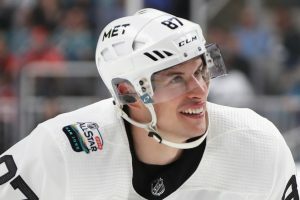 A surefire Hall of Famer, the Penguins’ captain surpassed legend Mario Lemieux as the franchise’s all-time leader in games played (916) on Saturday night in Tampa Bay. Lemieux, who is now a part owner of the Penguins, netted 1,033 points in his 915 games. He did miss games over the course of his career due to back surgeries, Hodgkin’s Disease and a three-year retirement.